Congratulations to "Mary P", the winner of Denise's giveaway. Thank you to all who participated! My name is Denise Moncrief, and I live in Louisiana with one husband, two children, and one very chubby canine. My family not only endures my writing moods, but also encourages me to indulge my writing passion. An accountant by day and a writer of romantic suspense by night, I lead a very busy and joyous life. I’ve been writing off and on since I was seventeen, and with several stories already published, I have no desire to slow down. What would you do if one morning you awoke in someone else’s body? Surviving as Jennifer Cristobal isn’t easy for Rhonda Prentiss. Three years ago, a sudden, fatal trauma stripped Rhonda of her middle-class, stay-at-home mom existence. A brand new shock prompts Rhonda’s essence to invade Jennifer’s soul, suppressing the other woman’s memories and replacing them with her own. When Jennifer’s heart transplant surgeon, Dr. Crane, can’t—or won’t—help her understand her unusual body-swapping dilemma, she turns to the only man she can trust. But can she fully trust Jennifer’s husband, Anson? Rhonda’s memory proves faulty—and sugarcoated. Multiple threats from her past shake her fragile hold on mental stability. If one of her enemies succeeds, he will kill Rhonda’s soul… or Jennifer’s body… or both. Hysteria insinuated its warped fingers into the convoluted whorls and ridges of my psyche. I ripped through the room until I found a huge walk-in closet full of women’s clothing. Row upon row of shoes were arranged neatly on the floor, handbags lined the top shelf. The Fendi I’d been gazing at for weeks lay toward the back of the stack as if it were yesterday’s toy. My shaky hand snatched open the nearest drawer filled with every accessory imaginable. I slammed the drawer shut. I borrowed a matching shirt and skirt. With another woman’s clothes on my back, I dared to look into the full-length mirror. I tensed. Someone was in the closet with me. I touched my cheek. She touched hers. I blinked, she blinked. The face reflected back at me wasn’t mine, yet there I stood, facing the mirror, gazing at my own reflection. I stuffed my hand in my mouth and dropped to the floor. Every hard thing I’d endured in the past few months came barreling out of my tear ducts, cascading down my cheeks, falling onto someone else’s expensive couture. I rubbed the unwanted moisture away with the flat of my hand then closed my eyes and forced them open again. Nothing changed in the interim. I hope you enjoyed this excerpt. 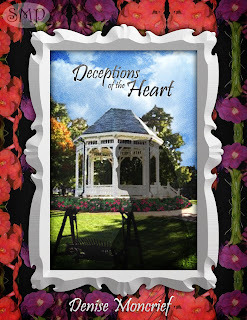 One lucky reader who comments on this post will be randomly selected to win an eBook copy of Deceptions of the Heart. Good luck! Deceptions of the Heart can be purchased from Amazon, Smashwords, and Still Moments Publishing’s web site at www.stillmomentspublishing.com. Please visit my blog at www.denisemoncrief.blogspot.com or my Facebook page at www.facebook.com/DeniseMoncriefAuthor. It looks like an interesting and unique story. I am impressed by everything Denise is able to accomplish. Sounds do enthralling. My kind of book. Sounds like a great book. I would love to have a copy of this. I actually just got my copy in the mail, but best of luck to the rest of you! Wow! Sure is a lot going on here and it sounds very interesting! Thanks for the chance. That would be so scary. This is going to be such a fabulous read. Waking up in someone's else body. That's freaky. I would be freaking out if it were to happen to me.